I will start at the beginning,bought this model at a model show with parts missing,for only £10.The trader had tried everything.I tried one of my sellers on eBay,bingo, he was able to get the part.That was 2yrs ago.Bought extra aircraft cheap,yes like cheap.One of the boxes were SB2U scout bomber,the first monoplane aircraft to serve on Saratoga. The research started,first the etching from Eduard ,the bridge is upgraded to 1940,which mean I could put more modern aircraft on board. Sb2U-1 Vindicator x12 TBD-1 Devastators x20 F2A-2 Buffalos x12 F3F-1 x12 the biplanes are tiny when, compare to the modern aircraft. VS-3SBC x12 Next problem was a display box ,most were showing to be £200.Fainted .At another show in Aberdeen.there is a trader who will make then much cheaper.The catch he will not post any(too many were getting damaged),or bring to shows,not enough space in his van.I,m in luck because he lives in Glasgow, which is only an hour for me each way.Same price as postage,which would have been,when he did post.That's why it's taken two yrs to get round to making this monster 90cm in length,height 23cm and width 20cm. After the Hunter F.6/F.6A (link), Airfix is to release in November 2019 a 1/48th Hawker Hunter F.Mk.4 kit - ref. A09189 Souce: https://www.airfix.com/uk-en/shop/new-for-2019/hawker-hunter-f4-1-48.html V.P. Hawker Hunter F.6, XE599/D, No. 74 'Tiger' Sqn, RAF Horsham St Faith, Norfolk, 1957. Morning folk's sorry to bang on about my current oldies infatuation but back to frog for a second entry,I think I might have built a Matchbox Hunter ages ago can't remember building Airfix's offering or Frog's.Not seen this kit in the flesh but it must be the same as the Novo kit being built by Pat. Hot on the heals of the Canberra, another beauty from the 50s, the elegant Hawker Hunter. This is my first 'Mistercraft' kit, and looks on first glance to be quite simple; very few parts and to my less than professional eyes, a reasonable shape. Not bad for about £6 on eBay anyway! The kit decals, however, were awful! Very blotchy looking 92 sqn checks, and some 1 sqn nose flashes that seem a bit too small in my opinion. As I'll be making my Sabre in 92 sqn colours, I wanted to do something different for the Hunter, so I splashed out on the Xtradecals set. A good choice on the Xtradecals, I'm still undecided on whether to do 56, 63 or 74 sqn! They all look fabulous to the point where I may have to get another Hunter! Whichever unit, I think it'll be nice with camo upper and silver undersides - classic 1950's RAF, the best genre! So, to the kit ... Does anybody have any tips about 1/72 Hunters in general, and the Mistercraft kit in particular? Any potential traps or issues to look out for? It really does contain very few parts! I'll need to file that pointy 'pen nib' jetpipe fairing flat for a start. Interestingly, the instructions call it an F.1, but the box and markings are all F.6! 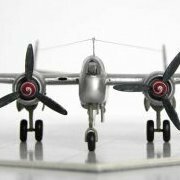 Your Airfix top (REALISTIC) future releases? Well, here goes! In at the deep end for my first WIP. All my previous builds have been projects that have several WIP's against them, but this is not seen so often. Continuing the theme of jets I worked on in the RAF, this will be a Hunter T7 to go with the Buccaneer in 237 OCU markings. I'm using the Academy Hunter F6 kit with the Heritage T7 conversion along with a few AM extra's On top of the conversion work, I'll also be trying to correct some of the Academy kits errors. Don't expect work to progress at a blistering rate, it took 6 months to build the Phantom!!! All the bits. The Heritage conversion set. The main fuselage components marked ready for cutting. Just off for a stiff drink before I get the razor saw out! Rob. We all know the sad history of HMS Barham and the film of her end.So went back to happy times and the model that Trumpeter produce of Barham 1941 is very close to 1937 version.Only have to take off the two 0.5 inch machine guns on B turret,add neutral stripes and the High angle control system without any radar on the fighting top.I also have HMS Valiant as 1945 Pacific colours and HMS Queen Elizabeth as 1918 waiting next on the slip way after Barham. My first build after long hiatus (explained more in my Heller 109K thread) the Hawker Hunter MkI. Completed this a couple months ago, just getting around to posting it. Actually used the Eastern Star reissue, but it's the original 1959 Frog tool. Built box stock with the exception of blanking off the intakes and I decided to give scribing recessed panel lines a go. Painted with Tamiya acrylics. Oh...I also used a piece of the sprue to carve the little bullet fairing at the back of the horizontal stabs. Yes...that's a pilot's head molded into the solidly blanked off cockpit...and the wheel well outlines are simply scribed into the bottom...it was 1959, after all. Still, builds a nice looking model of a beautiful jet IMHO. I know this is not a modelling related question, for which I apologise, but I am sure this is the best place to find an answer to my question. I am currently writing a book on Hawker Hunter operations in Aden in the 1960s and am seeking a set of badges for the squadrons that served in that theatre. Can anyone point me in the direction of a website dedicated to RAF squadron and airfield badges please? Thank you for any help you can give. 1/48 - Hunter T.7 & T.8 resin conversion sets by Heritage Aviation - T.8C & M sets released! Source: http://www.britmodel...mp;#entry847702 Speak for itself. Thanks Ozh! V.P. T.68 HB-RVV Pics from Graham James. Hawker Hunter GA.11. WV382 at Aeropark East Midlands, pic mine.